Recent reports about the pricing of the Windows RT says that Microsoft is pricing the Windows RT a bit heavily, from the tablet manufacturers. The report has been released by VR-Zone during the Computex, however there has been no confirmation about the report by Microsoft. 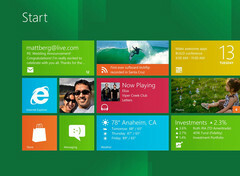 Windows RT is the recent version of the Windows which has been designed for the tablets. The report also says that Microsoft is charging the tablet manufacturers about $80 to $95 per license for the platform. So the price for the Windows tablet might be a bit higher from the regular tablet prices. The prices might be on the range of $549-$799 at launch and the premium tablets might even get up to $899, which will make them even costlier than that of the iPads. This might be a problem for the Windows tablets for to compete with the dominating iPads in the market.